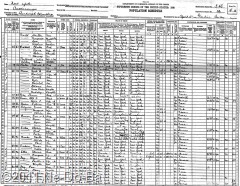 1930 U.S. Census, Randolph, Cattaraugus Co., NY, Pg. 4, dated 15-Apr-1930. Frederick H. Horton, head, owns the house valued at $500, he owns a radio set, male, white, age 77 married at age 28, he can read & write, he and both parents born in NY, no occupation. Carrie, wife, female, white, age 74, married at age 22, can read & write, she and her mother born in English Canada, her father born in Illinois. The big news this year is they own their modest home and he has given up farming. Of course at age 77, retirement seems a particle course of action. I could look for property records to get a better idea of when they purchased to house, but it is not a high priority. Once again, Carrie says her father was born in Illinois while she and her mother are from English Canada.